Ha Giang is one of the most gorgeous yet least-visited destinations in Vietnam with stunning terraced rice fields, and the crowning title as the northernmost location in the country. Getting here may require some research for travelers. Fear not, I have done your homework and covered every possible way! We have been on a journey from the South to the North of Vietnam with the Christina’s Blog, crossing golden sandy beach fronts, lush green rice paddy fields, bustling cities of Saigon and Da Nang, to the prestigious old quarters of Hanoi. 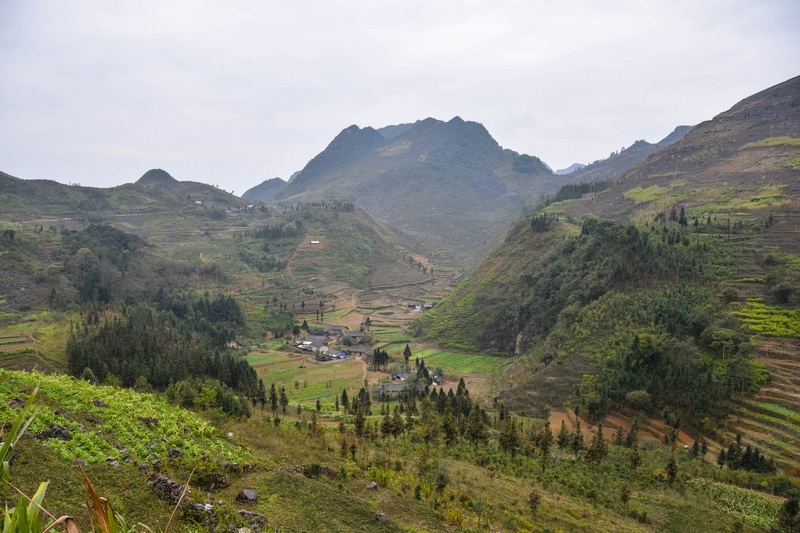 Now let’s hop on the back of the bike and head to the northernmost Ha Giang province, a destination that remains undiscovered by crowds of tourists. Ha Giang still retains its pristine scenery that has stood the ravages of time for the last 20 years with spectacular geography and a diverse culture of many ethnic minorities. Here lie the most beautiful terraced rice fields, opening up as you traverse the mountainous roads. On the way to exploring Ha Giang you will also be stopping by many ethnic villages with unique cultures and lifestyles. As a whole, you will experience a lot of fantastic mountainous scenery, with breathtaking hills and valleys, and the most beautiful place that should be on your list is the Dong Van Karst Global Geopark, representing 400 million years of geographic transformations – rivaling the Trang An Complex of Ninh Binh. You should consider getting to Hoang Su Phi village for the world’s most surreal landscape of rice paddies also. As you start to finish conquering Dong Van plateau, one last exciting destination is the Lung Cu peak with the beautiful flag of Vietnam riding the winds, overlooking the border to China. You, fellow travelers, can hop on either a coach, a sleeper bus, or a motorbike to get to Ha Giang from Hanoi. 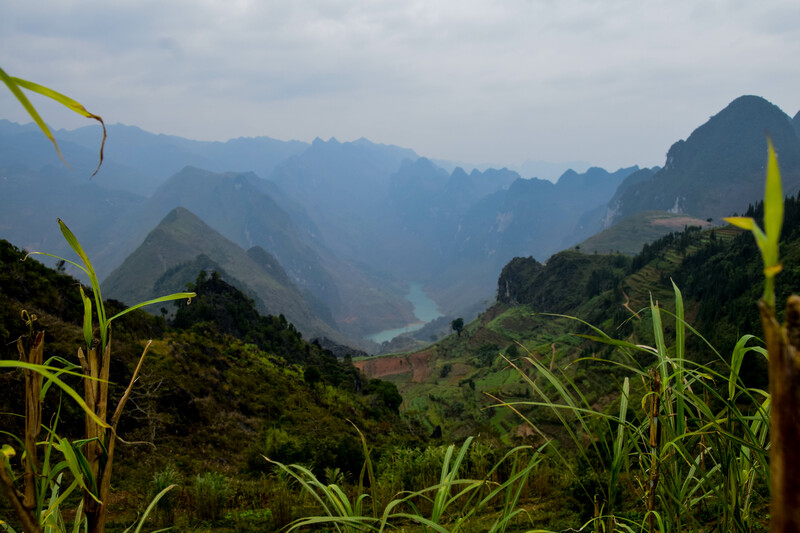 Private car and tour options are still more accessible to the Vietnamese at this moment rather than to foreigners, so your best bet is planning on an adventure to Ha Giang by yourself. Just in case, Hanoi Journey is the most well-received private car operator to Ha Giang right now, with fun-loving private tour guides. But it will surely be more rewarding to explore all the places personally on the back of a bike, won’t it? And try to spend at least three days there to actually discover Ha Giang to the fullest. There aren’t many travel options to choose from, and while most of them are easy enough, there is one thing to take care of if you want to fully explore the beauty of Ha Giang – getting a local travel permit to visit preserved remote villages, which are usually the farthest and the most beautiful destinations such as Meo Vac, Dong Van, and Lung Cu etc. A permit is not that hard to obtain. When you book an accommodation, just ask your hosts and they will surely assist you in getting one. Here are some great homestays in Ha Giang. And if you have to do it by yourself, once you are in Ha Giang, head to the immigration office at 415a Tran Phu street. The officer will just need to file some information from your travel documents (i.e passport) and also your motorbike registration number if you get there by bike. The permit costs only around 10 USD, and there is also an office in Meo Vac town’s police station in case you forget to get one in Ha Giang city. It is relatively easy to book these buses and getting scammed is minimal, which makes the bus the most optimal option. 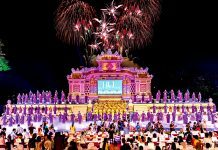 You can ask your accommodation host to help with booking a ticket at ease and tickets are available at almost any travel agency in Hanoi, where you can get insights about the quality, services, and price. You can also try booking online via vexere.com, which lists all the vehicle options (express buses and sleeper buses). To completely avoid scams, you should only reserve and then pay directly upon collecting the ticket. 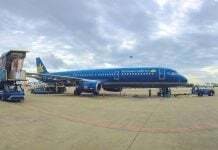 The price ranges from 200,0000 VND (8 USD) to 300,000 VND (13 USD), depending on the amenities of the bus (wifi, outlets, water and snacks, toilet, etc.). Unlike other popular routes to Ninh Binh or Sapa, there will hardly be any tour guide accommodating you along the way, since the destination is not that popular to travelers not from Vietnam. Usually, you will get a pleasant ride with air conditioning that takes around six to eight hours depending on the time of departure. The bus usually stops once at a petrol station where you will have a break and you can enjoy some local snacks also. It is also important to know that before actually heading off to Ha Giang, the driver may circle around Hanoi to pick up passengers to fill up the empty seats. Night: 9:00 – 10:00 PM, arrives in the early morning. Sometimes it can take only three to four hours to get to Ha Giang at this time, but the driver will let you rest on the bus until morning so you should not worry about this. 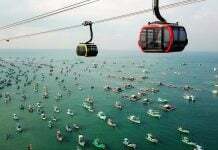 The trips during the daytime should be safe, smooth, and you will enjoy sightseeing along the way. As always, consider taking the night trips with a grain of salt, because these issues will somehow kill your convenience: smelly backpackers and locals, endless honking, fast-and-furious maneuvers from the driver shaking you left and right (the earlier he arrives, the more money he saves on petrol and such), total darkness poses risk of accident, and zero sights to see. Best Transportation to Experience Ha Giang – Riding a Motorbike! This is considered the most rewarding way to get to Ha Giang and actually experience the legendary motorbike loop circling the mountains and rice paddy fields. You should avoid departing during the night for your own safety because trucks and 18-wheel drivers will take it for granted that the road is empty. This trip takes around six to seven hours non-stop and it’s pretty straightforward. And of course, the time will increase proportionally depending on how many times you want to stop for rest and photos. Bikes can be easily rented in Hanoi, check our “Getting Around in Hanoi” article. Make sure that your bike is in perfect condition before tackling the adventure to Ha Giang. Keep in mind that refilling the fuel tank regularly is vital, whenever you see a petrol station, it is truly rural out there. Bring an extra 1.5-liter empty bottle to fill up with gas in case of long distance traveling between destinations, and you should only buy petrol from official stations rather than local vendors. They tend to dilute the fuel for profit and this could lead to malfunctions with your bike. 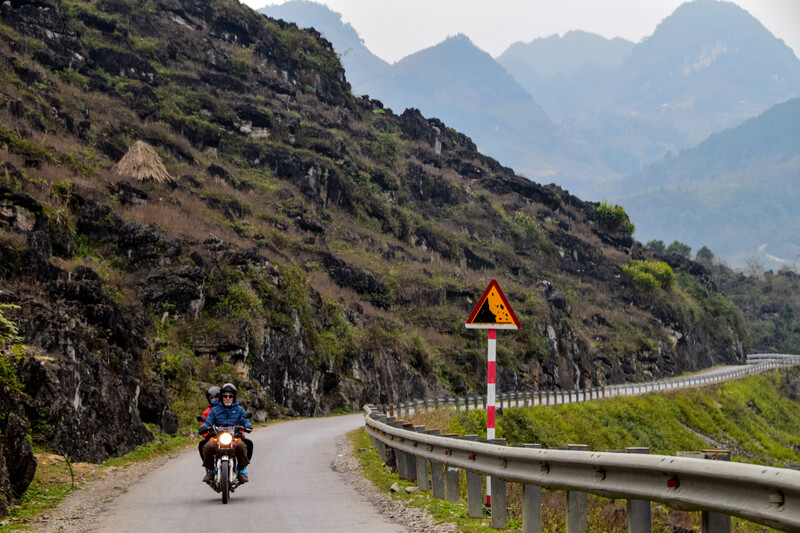 Getting to Ha Giang on your own bike is fairly easy, just stick to the AH14 – QL2 road (National Road #2) and you will be there in no time. Having GPS is also important in case you stumble upon a confusing intersection. 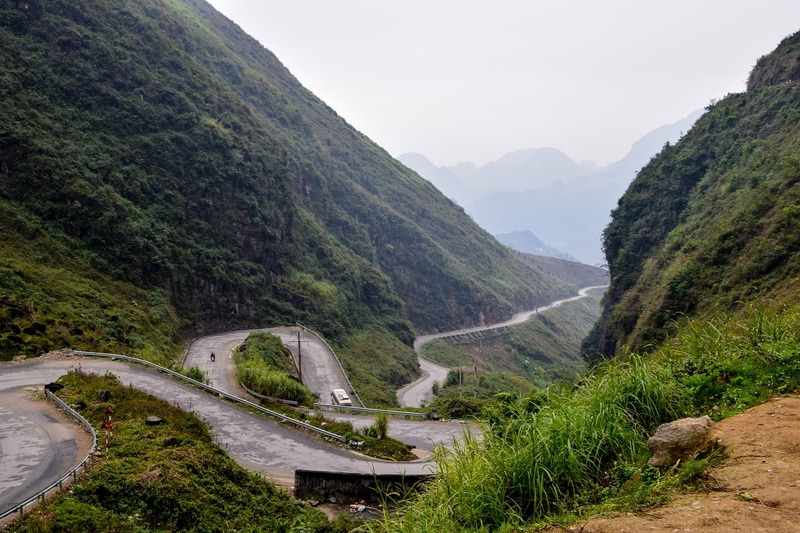 As the route is pretty much flat even prior to arriving in Ha Giang, you will have no problem with the 3G connection along the way. The general direction is to the north for your information. Meo Vac Town: Challenge yourself with high-altitude motorbike loops on the way, and experience the Sunday Market with all the village people from different ethnicities. Local food, freshly boiled corn and dazzling rice wine are there for you to try. Sa Phin H’mong Village: Former capital of the H’mong reign in the north of Vietnam, in this village you can visit the H’mong King palace and learn about the history of Ha Giang, as well as the connections between H’mong people and other local ethnicities. Noong Lake: A vast and shallow freshwater lake where trees are growing in the middle with dancing shrimp and fish, what’s not to love? Are you nimble enough to catch some with your bare hands? Ma Pi Leng Pass: Conquer one of the most difficult and beautiful mountainous motorbike roads in Vietnam. I do not need to describe anything, the picture below will do it justice. Hoang Su Phi: It boasts untouched nature, ethnic villages, cultural heritages and stunning rice terraces. Dong Van Karst Global Geopark: This is the star of the adventure. As you cross the cloudy Quan Ba Gate to Heaven at 1,500 meters above sea level, a whole new world opens up: Grandiose mountains that light your climbing spirit on fire, colorful ethnic villages to discover, challenge yourself with the steps to Lung Cu Flag Tower, and explore the prestigious Dong Van Ancient Town. Since Sapa and Ha Giang are two famous destinations for travelers, you should not exclude one place to visit the other. First, let me give you some facts. The distance from Sapa to Ha Giang city center is at least 240 kilometers depending on the route you choose. However, the challenge is in the endless winding mountain passes, bumpy trails, and even dense fog when the weather drops in the morning or evening. But don’t worry, because if you don’t feel comfortable riding a motorbike, you can always choose a coach. Traveling by bike and coach are the most common way to get to Ha Giang, and I will explain carefully below. If you have an adventurous soul, traveling by motorbike is definitely the way to go. You will be rewarded with pristine, breathtaking natural scenery along with the friendly, welcoming, and hospitable local people. Look how happy the children are when you wave at them! But don’t give them money or candy, because this creates a bad habit. 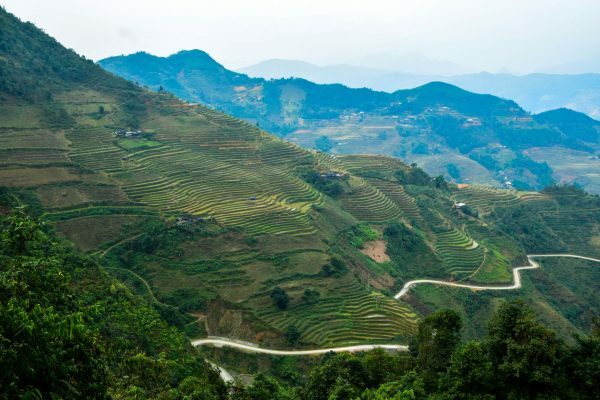 The fastest route to Ha Giang city is around 240 kilometers, but the most worthy route to Ha Giang, especially when you’re riding a motorbike, is Sapa town – Lao Cai city – Bac Ha – Xin Man – Hoang Su Phi – Ha Giang city (280 kilometers). You may have been wowed by the gigantic mountain ranges in Sapa, but now prepare yourselves for the majestic terraced fields in Hoang Su Phi which belongs to Ha Giang province. I know that the scenery is distracting, but you should pay attention to the road, especially the Bac Ha and Xin Man sections. Check out the maps carefully if you don’t want to get lost in Simacai district of Lao Cai province. You can either book the ticket online here or ask the hotel to book it for you. It is simple, so no rush! That pretty much concludes everything about getting to Ha Giang from Hanoi. More in-depth information about how to spend a perfect time in Ha Giang is covered in this article. And please keep in mind that this province preserves the ethnic minorities’ cultures and heritage, so do not expect to have any accessible tourism venues and do not disturb the local life. You should avoid using non-disposable plastic bags and bottles in the villages also. 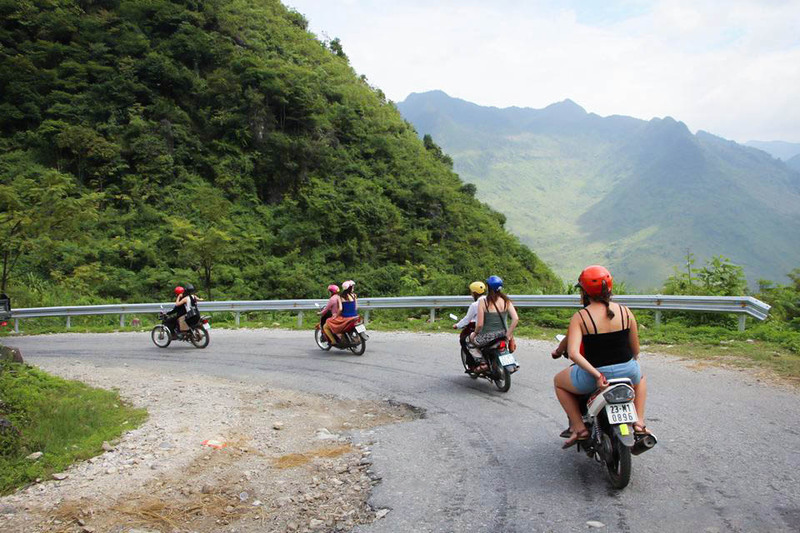 Nevertheless, fast travels and ride your way to Ha Giang! More well-crafted Ha Giang guides can be found down below.